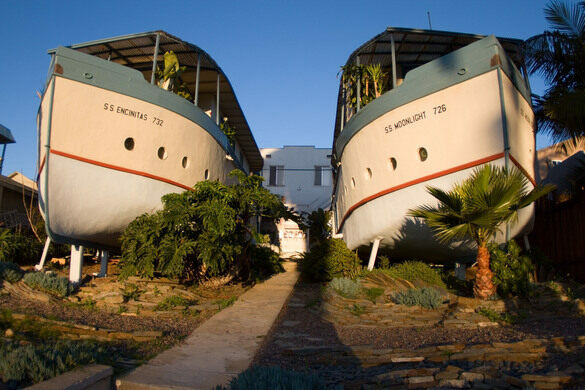 These unusual houses look like giant boats that washed ashore on a residential street. 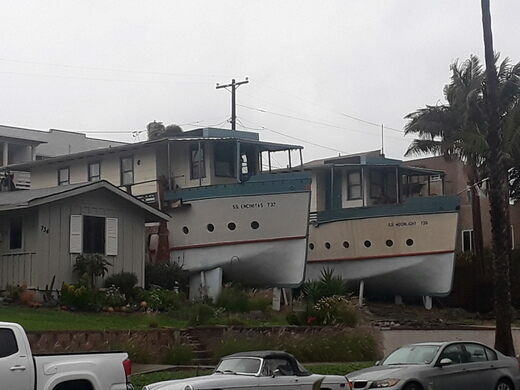 Among the bungalows lining the street in a California beach city are two most unusual houses. The buildings are shaped like boats, making them look like they’ve accidentally washed ashore and crashed within a residential area. Lucha Libre (Mexican Wrestling) Themed Taco Shop. "Only the devil could play golf here." The restored and active Victorian-era final resting place of San Francisco. 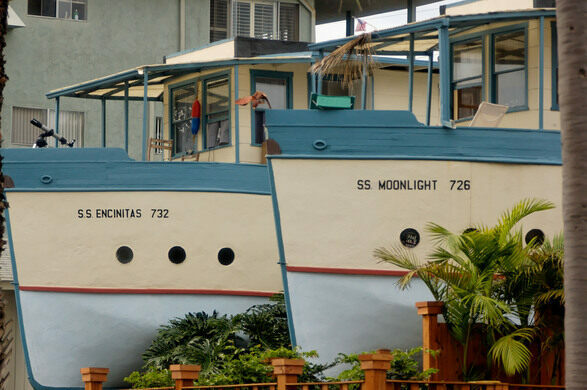 The S.S. Encinitas and S.S. Moonlight, collectively dubbed the “boat houses,” are located at 726 and 732 3rd Street. 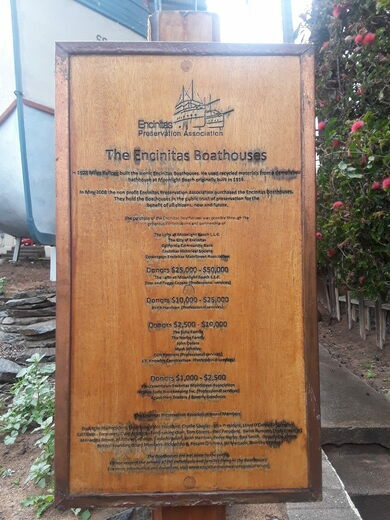 Local architect Miles Minor Kellogg paid homage to his sea captain father by creating the Encinitas Boathouses in 1928, using the reclaimed and recycled lumber from a landmark nightclub. From 1888 to 1925, the Moonlight Beach Dance Hall and Bathhouse stood as a North County San Diego landmark. Unfortunately, the local establishment fell victim to the dry years of prohibition and closed its doors. 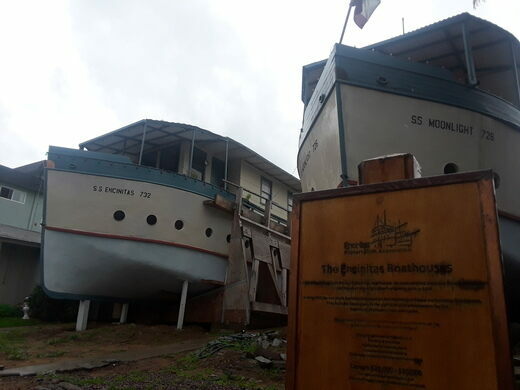 Seizing the opportunity, Kellogg re-purposed the lumber from the nightclub and began constructing the two certainly non-seaworthy boat-shaped homes. 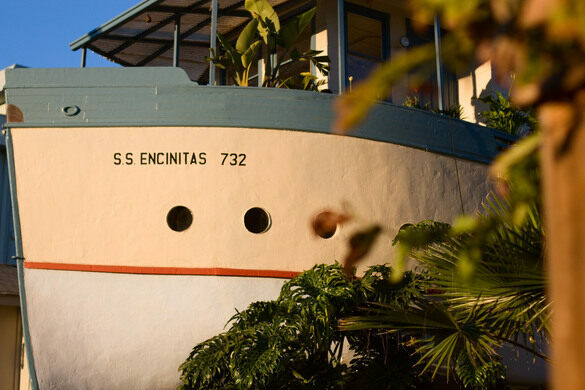 The Encinitas Preservation Association acquired the unusual abodes in 2008. The houses still stand and are still lived in today. They’re impressive feats of vernacular architecture, and there are future plans to restore the buildings and potentially offer public tours. There's plenty of street parking. Please be respectful of tenants as both Boathouses are currently renter-occupied. The oldest structure in a beachside California city was built to serve eight students. What began as an illegal art installation has become a symbol for unity, ocean awareness, and coastline preservation. This unique sanctuary invites you to interact with the beautiful birds. An enormous goose sits atop this nest-shaped home. The sole surviving relic of the San Francisco neighborhood cobbled together from old horsecars and streetcars. One of Amsterdam's narrowest houses is located right across the canal from its widest. The first (but not only) upside-down house in Germany.